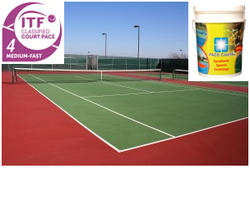 We Balaji Sports Co. only One Manufacturing Firm in India dealing in Tennis Court Coatings. We undertake Tennis Court Construction to produce the best Tennis Surface Floor Coating, Our product range also comprises of Synthetic Sports Coating Products, Acrylic Concrete Primer and Acrylic Resurfacer. The Courts prepared by us are in compliance with the set international standards of size and dimension. We are rated as a reliable Tennis Court Construction Company. The variety of our Court Surfaces is made using the best quality raw materials. We are a leading name in the Synthetic Tennis Court manufacturing.